Russ Pitts, an avid gamer and journalist who co-founded Polygon, has launched a second Kickstarter campaign to make a reality of his dream to produce a series of films about independent game developers. 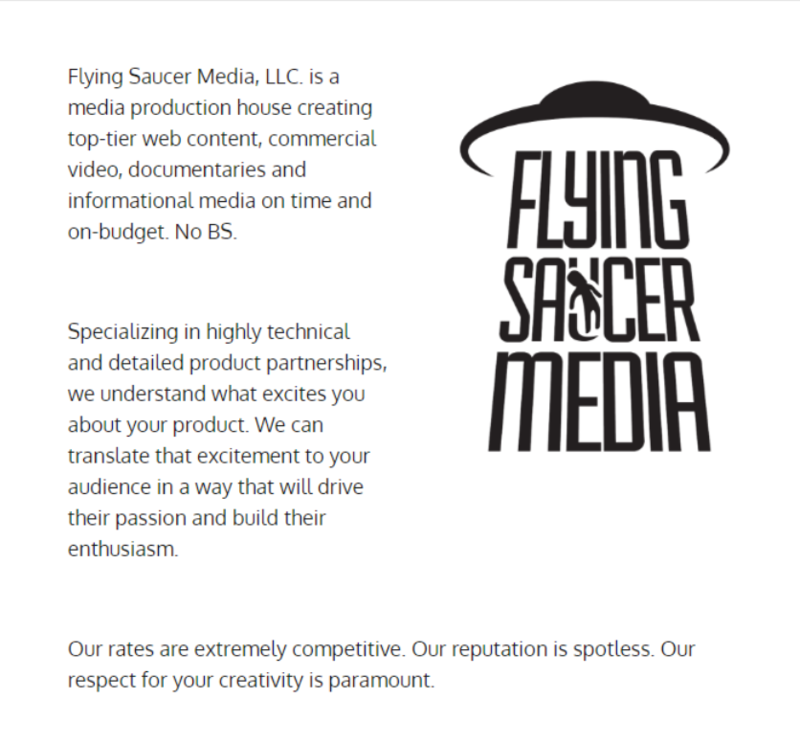 He operates a company called Flying Saucer Media, based in Durham, N.C. He was kind enough to take some time to answer a few questions about plans for his Stage of Development project. In the interest of full disclosure, Prologue Games is backing this project. Q: How did Flying Saucer get started? A: After I left Polygon in 2014, I didn’t really have a plan for what to do next. I’d just finished a huge reporting project that became the book “How Video Games Are Made”, and had a piece of my “History of Xbox Live” story left to do, so I knew I was going to work on writing projects. But I had also really enjoyed working on the Human Angle video series. I felt that experience was pulling me to try more documentary work. As luck would have it, Harmonix called me to ask if I wanted to submit a bid for some behind-the-scenes work they wanted done for Rock Band 4’s launch. So, at their urging really, I started a company, submitted a bid and … got the contract. Which was kind of a surprise. So then I had to staff up and go make those films. And it was awesome. After that there was no going back. Q: What compels you to work on a documentary series about indie game developers? A: I find all people who make games fascinating. And I knew going into the “How Video Games Are Made” project that bigger teams are harder to cover. Mostly because, at a certain size, a game making team starts to specialize beyond the point where the contribution of any one person is easy to describe. I’ve enjoyed Geoff Keighley’s “Final Hours” work, and that was definitely an inspiration as we talked to AAA studios about “Human Angle” style pieces at Polygon, but indies are just so much easier for people to relate to. When you have 3-5 people working on a thing, it’s just straight-up simpler to make sense of what’s happening. So I tend to gravitate to the indies. Also, with indie teams, a lot of times the story of their lives is wrapped up in the story of what they’re making. The stakes are higher for them, and so their motivations and dreams are easier to connect with. Q: Why does it fall to someone like you to invest their time/money in this kind of coverage? Why do you suppose major games media sites aren’t already doing this for their audience? A: I mean, I’ve done it with a major games site, so I feel like I have a clear perception of why they’re reluctant to do it. Over the course of my career, every time I’ve wanted to take a video crew out to do a long, detailed piece on a game team it’s been an argument about how long it would take, how much it would cost, and how many other things those people could be doing instead of working on my project. When you’re deep into a “every pageview matters” business model, you have no choice but to slide your editorial direction towards creating only content that will efficiently spike the pageview needle. It’s not even about ideals, really. You literally have no choice but to slash content that radically opposes a high pageview-to-cost model. So even when you start a thing with good intentions of doing quality over quantity, if you’re tied to the ad-driven content model (which all websites currently are) you’re going to eventually focus on quantity over quality. And that’s … basically the opposite of what I do. Q: What’s involved in the making of an episode of Stage of Development? Where do you expect the Kickstarter money to go? A: The Kickstarter money will go to time. That’s the main expense. Outside of plane tickets, hotels, food, etc., what I’m really paying for is time. The people on the Flying Saucer team have other jobs, because we’re a strictly part-time enterprise. So if I want to keep them working on my projects, I need to pay for their time, or someone else will. They have to eat, too. So I’m paying for my crew to spend a week with me in Chicago, and we’ll hopefully recoup some of that initial expense with the Kickstarter money. That’s a week of lodging, travel and food. And during that week, we will shoot for at least 10 hours a day, talking to the different people who make up these stories, and getting some good footage of where they work and live. And most of the rest of the money I’m raising through Kickstarter will go towards paying for the crew’s time while we edit this thing. When we do this style of film, most of it is made in editing. And that’s me spending a day or so making a rough cut of the story as I want it to be, taken from the available footage we have. Then I send it to Christian, who adds broll and effects and adds his two cents, story-wise. Then we go back and forth until we’re both happy. Sometimes that takes a couple of days; sometimes it takes a week. But the heart of that work is translating what we heard and saw in interview into a story on film that the audience can understand. How do you communicate someone’s soul, in film, to another person who has no prior knowledge of anything you’re talking about? That’s literally what we do, and it’s not an easy thing. So I’m asking for people to help me pay for the time I need to do it. A: I have a hard deadline on my own time, and that is when I have to get back to work shooting the Desert Bus for Hope documentary in the Fall. So I’m hoping we’ll have at least the first four of these films finished by then. As for exactly when we’ll release each one, and on what platform, that’s still up in the air, but our backers will definitely get the final films when we’re finished with them. So, again, this Fall. As for when they’ll be available beyond that, I have a tentative distribution deal with one major web media company. If that holds, then those questions will be answered by them. Otherwise I’ll publish the films on whatever platform(s) makes sense to me at the time. Q: What made Chicago appealing for the first episode? What other cities do you want to explore for their indie dev scenes? A: There was some measure of expediency in the decision making there. I was familiar enough with the Chicago scene that I could already guess at what stories I wanted to tell there, and who I would need to reach out to to make that happen. But, like, I wouldn’t have picked it if I didn’t also have a curiosity and an interest in the place. Basically, when I pick a documentary subject (or, in this case, a city), it has to be something or someone I’m comfortable spending months of my life getting to know well, right? Like, if I don’t intrinsically like someone, I’m going to be uncomfortable getting to know them well enough to make a movie about them. I’ve been down that road, and it’s not fun. Chicago, for me, represents a nice intersection between stories that interest me and that I know I can tell in the time and with the resources we have. Q: Are there particular types of indie games that appeal to you more than others? A: I don’t find any particular type of indie games inherently more interesting than other indie games. And really, for these stories, the games themselves are almost beside the point. I have found that, in general, interesting people are going to make interesting games. Which holds true in the reverse, right? Interesting games tend to be made by interesting people. So, for me, that’s what it’s about. I’m curious about the intersection of a creator’s humanity with their art. And in this case, the art is video games. Q: What’s the first computer game you remember playing that stuck with you and why? A: Impossible Mission on my friend Doug’s Commodore 64. I played that game, and it was fun, but what kept me thinking about it was wondering who that character was, and what was the place he was in and how did all of that come about? Like, it’s a relatively simple game by today’s standards, but someone made creative choices there. And the thinking behind those choices intrigued me. Q: You’ve tried the Kickstarter route at least once before. What did you learn from the first go-round and how did you adjust for this latest effort? A: I learned a number of lessons from the last SOD Kickstarter, three of which, at least, I hope I’ve successfully addressed. The thing is, with the Kickstarter from last year, I didn’t have any hard data. I knew what I wanted to do, but I’d only worked inside of another media company’s umbrella. I had no clear data on what kind of audience I had versus what audience Polygon had for my work, etc. So I didn’t know how big my audience was, how much money they would be willing to help me raise, or what they even wanted, really. I just knew what I wanted to do, how I wanted to do it, and how much that would cost. So that’s what I Kickstarted. So the biggest data point that came back from that was how much money I could reasonably raise. That’s the biggest adjustment this year. I’m asking for less than a quarter of what I was asking for last time. 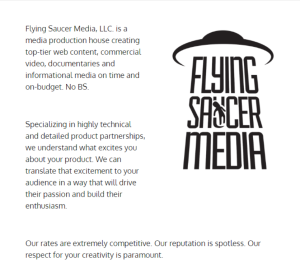 And part of that is because, in the process of working on last year’s project (which became the pilot for this year’s Kickstarter) the Flying Saucer team learned a lot about how much we can do with a little bit of money. We’ve gotten a lot more efficient and focused over the past year. The second big lesson I learned was what the audience I can say is “my own” actually wants. And that’s slightly different from what I expected, but still well within what I’m comfortable making. Last year, the focus was on a broader slice of the “gaming community”, but we’ve narrowed that focus back to indie game makers this year. And we’ve been able to find a nice core of narratives in the Chicago area that will tell an interesting story when told together. The third big lesson I learned was in how to present a Kickstarter campaign and how to manage it. And last year, I don’t want to make it sound like I’m blaming anyone else, but I was getting a lot of advice from a lot of places, and basically nobody actually knows how to run a Kickstarter. Some people are successful, and some aren’t and sometimes those are the same people. So this year, instead of relying on experts, I was able to draw from the data I accumulated from last year and focus on clearly describing my goals in a way that I hope better communicates to my audience what it is I am asking them to help me do. And we’ll see how well that goes. Q: What happens if you don’t meet this Kickstarter goal? A: Obviously, I’m hoping that doesn’t happen. But if it does, I can tell you based on prior experience that I will spend at least one solid day feeling sorry for myself. Then I’ll get to work on whatever is next. Wes Platt is the lead writer/designer for Prologue Games. Their first game, an episodic narrative adventure called Knee Deep, launched its final act on Steam in March. Before that, he was a professional journalist for the St. Petersburg Times and Durham’s Herald-Sun. He designed collaborative real-time adventures at OtherSpace, Chiaroscuro, and Necromundus for players at jointhesaga.com. He also worked as a design lead on Fallen Earth, a post-apocalyptic MMORPG, from 2006-2010. He’s on Twitter at@DougPiranha. Reach via email at wes@prologuegames.com.